A land of thousands Pagodas, Thailand never fails to charm visitors from all over the world. You could be on your 100th visit to Thailand and still find something that will surprise or take your breath away. 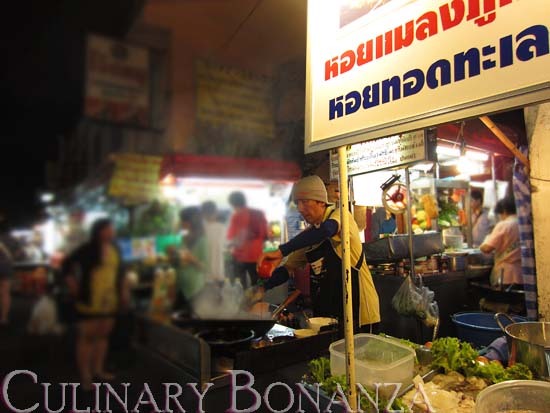 Thailand is not only a shopping heaven for bargain hunters and tourists, but is also a culinary melting pot that acquired the rich South East Asian influence and more recently, Western and greater Asia influences as well. 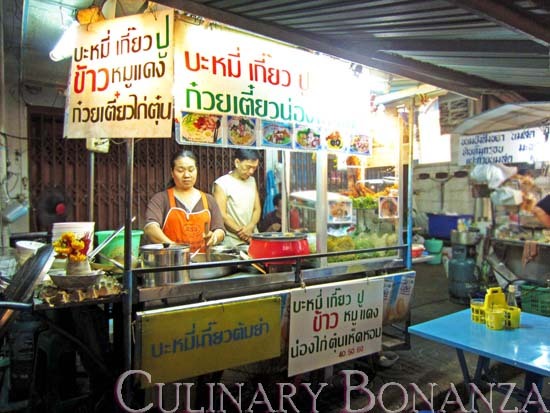 This culinary diary (3 posts in total) shall take you on a journey to a few select dining spots worth visiting, for your next trip to Bangkok. Soi is the term used in Thailand for a side-street branching off a major street, a Thanon. If you’re around Sukhumvit area and crave for some late night supper or snack, head down to Soi 38 Sukhumvit, which turns into a temporary food market at night. This spot is accessible not only by taxis, but also by BTS (alight at Thong Lor station). At Soi 38 Sukhumvit, the first 200m or so of the Soi is packed with food stalls and street food vendors as well as carts offering anything from the famous Mango Sticky Rice dessert (Khao Niew Ma Muang), oyster omelet, herbal fishball noodles, Pad Thai, pork skewers or satay (Moo Ping), Tom Yam Kung to wanton noodles. 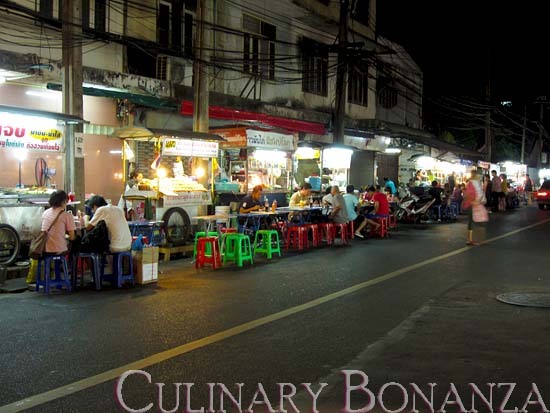 Here, you can experience dining local fares, the local way, as you sit at plastic tables and chairs laid along the street next to the food carts and enjoy the night scene and watch the cars zooming past you. Don’t be surprised to spot some fancy sports cars with good-looking passengers inside. For non-locals, choosing what to buy and inquiring for price might be quite tricky as the vendors here hardly speak English. So the best thing to do is visit this place with a Thai friend or guide who speaks English and who can translate and explain about the food to you. Alternatively, you could take a peek at what the others are eating and guess which stall it probably came from. I was told by a local that this Soi has become too touristy and the prices are expensive for local standards. However for Jakarta standards, the food is still comparatively affordable. 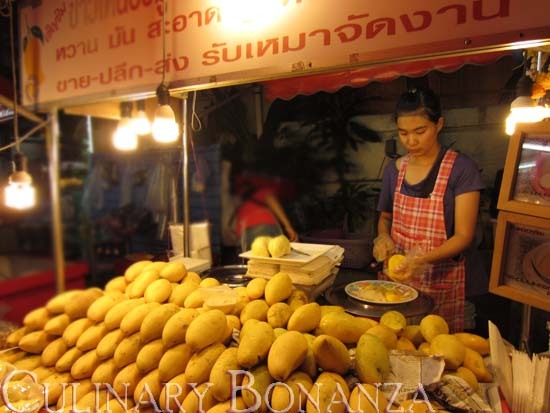 The most recommended item that you must try is the Mango Sticky Rice, which cost only 60 THB. It does not matter from which vendor you buy from, as the prices are the same. 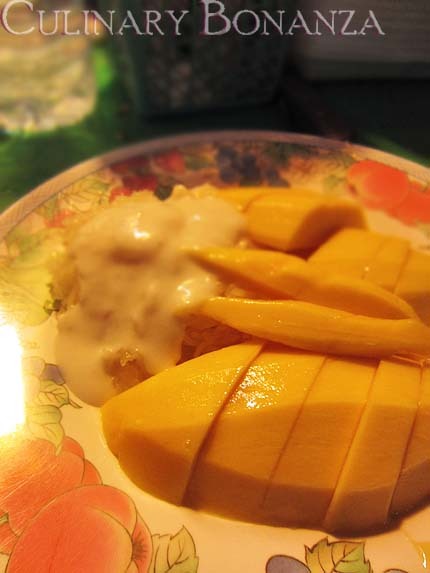 The mangoes are unbelievably sweet and succulent, served with sweet coconut cream and savoury sticky rice. Don’t ever leave Thailand without trying this world-famous dessert at its place of origin. Original Mango Sticky Rice. CAUTION: One serving is NOT enough. I can't wait for my trip to Thailand, yummy & cheap food everywhere! For the record, most Thais don't understand English. Due to different pronunciation, a simple word like 'Central' could sound entirely different when they pronunce it. Got to be careful when catching cabs there, some of them are tricky and play with the meter, or take you on a big tour to a destination that's actually only a few steps away.